This module of the website is aimed at the Regulator who have the responsibility for setting risk criteria, administering planning controls and approving development proposals under the requirements of specific planning controls or a policy. The format of the module is for a series of Questions relating to the understanding required by the Regulator in respect to a number of aspects relating to the implementation of a landslide-zoning scheme, policy requirements and the approvals process. Multiple choice answers are provided. If you are not sure which answer may be correct, then click HINT next and further information will be provided to assist you. You can test your understanding by selecting an answer to see if you are correct or learn why your choice was not. If you chose the correct answer, you can either read the detailed answer or skip to the next question. Each detailed answer provides further links to more resources, such as video explanations, presentations or PDF extracts from guidelines that have been developed by the Australian Geomechanics Society. Further topics are discussed by FAQ pages which pose a series of questions and then give further explanations. At any time during this module, feel free to launch the guideline PDF’s to research your answers, or simply to give yourself a refresher on Landslide Risk Management. 1. 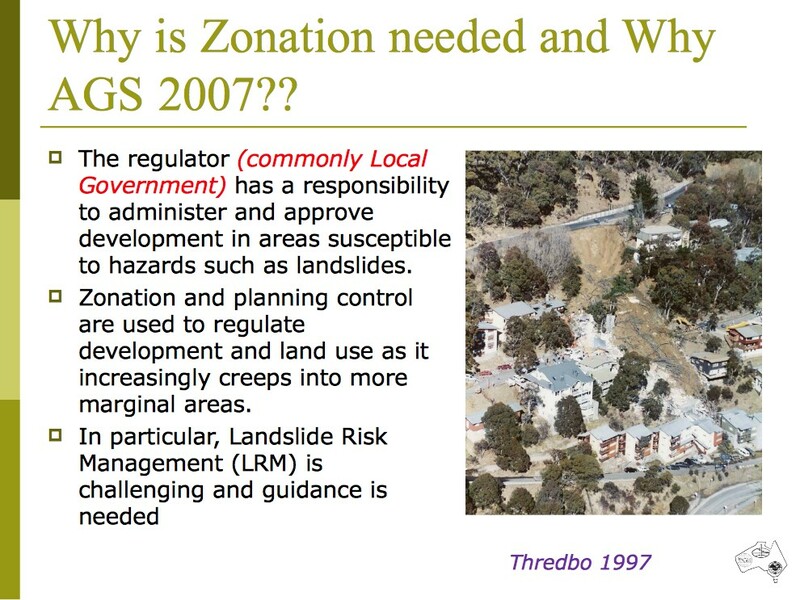 What is landslide zoning and why is zoning needed? Landslide zoning divides a landslide into its constituent parts and is only used in inventory mapping and research. Landslide zoning divides land into areas of similar landslide potential and is commonly used for planning urban development but can be applied at state and federal level. 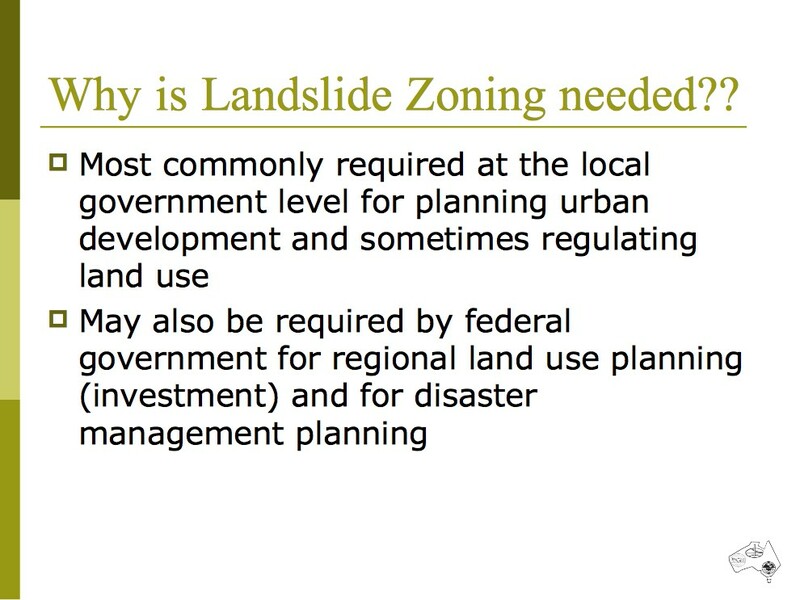 Landslide zoning is the same as land use zoning and is only used by local government. Landslide zoning divides land in areas of similar elevation and is only used by academic researchers. Generic zoning is usually associated with some type of division of land into similar characteristics and is used in applying planning controls. Zoning is defined as the division of land into homogeneous areas or domains. 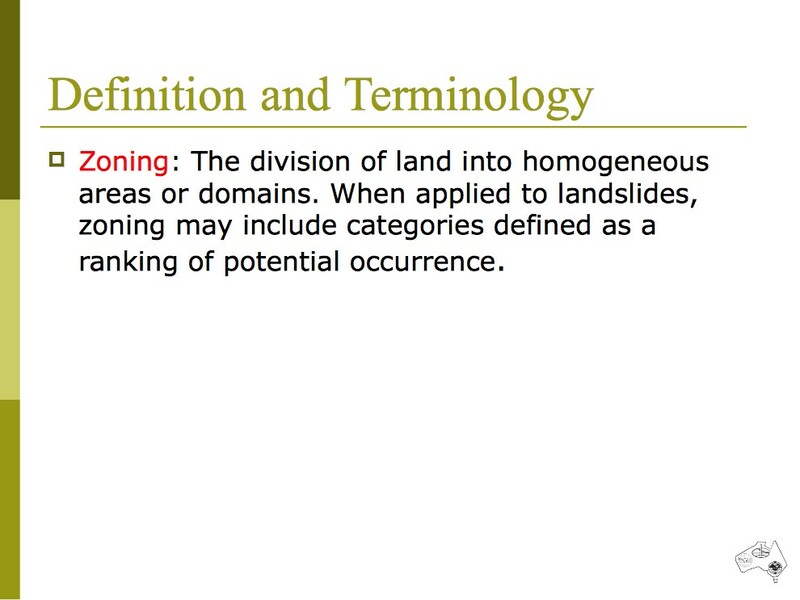 When applied to landslides, zoning may include categories defined as a ranking of potential occurrence. 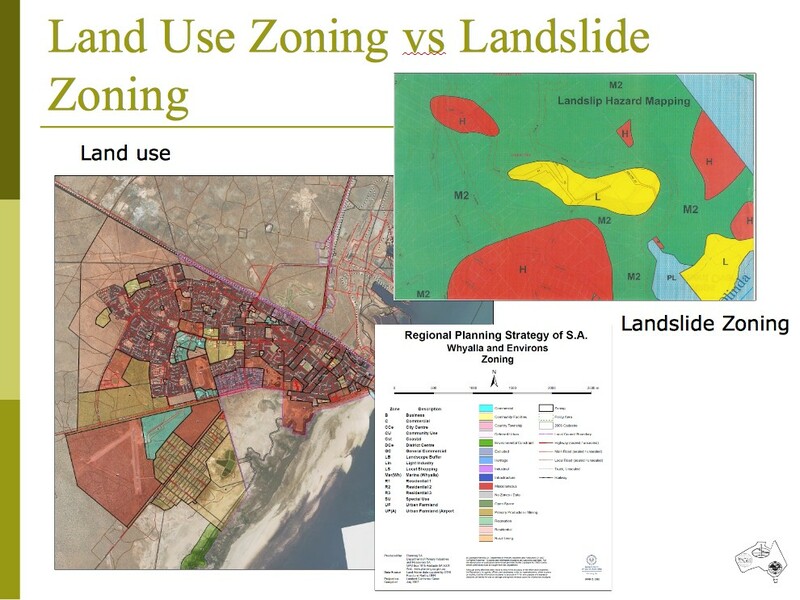 Landslide zoning for land use planning is most commonly required at the local government level for planning urban development, but may be required by state or federal governments for regional land use planning or disaster management planning. It may also be required by land developers, those managing recreational areas or those developing major infrastructure such as highways and railways. The identification of situations that are more susceptible to landslide occurrence through landslide zoning would facilitate development planning and landslide risk management. It is the combination of having an area, which is potentially subject to landsliding and the scale and type of development of the area that will determine whether landslide zoning is needed for land use planning.